Our tour leader dah pun create a Whatsapp Group for our GLAM team and I am pretty sure this trip gonna be fun! The Oriental Pearl Radio & TV Tower (Chinese: 东方明珠塔; pinyin: Dōngfāng Míngzhūtǎ, official name: 东方明珠广播电视塔) is a TV tower in Shanghai, China. Its location at the tip of Lujiazui in the Pudong district by the side of Huangpu River, opposite The Bund, makes it a distinct landmark in the area - Wikipedia. Huangpu River, a symbol of Shanghai, originates in Dianshan Lake and empties into the Yangtze River at Wusongkou (mouth of Wusong River). It is 114 kilometers (71miles) long and 400 meters (0.25 miles) wide. It is ice-free year round. The river divides Shanghai into east and west. It is a silent eyewitness to Shanghai's history and its development. Subhanallah..cantiknya scenery waktu malam! Can't wait for this! Another shopping spot. Bersiap sedialah ya ibu-ibu semua. The Bund (simplified Chinese: 外滩; traditional Chinese: 外灘; Shanghainese: nga3thae1; Mandarin pinyin: Wàitān) is a waterfront area in central Shanghai. The area centres on a section of Zhongshan Road (East-1 Zhongshan Road) within the former Shanghai International Settlement, which runs along the western bank of the Huangpu River, facing Pudong, in the eastern part of Huangpu District. 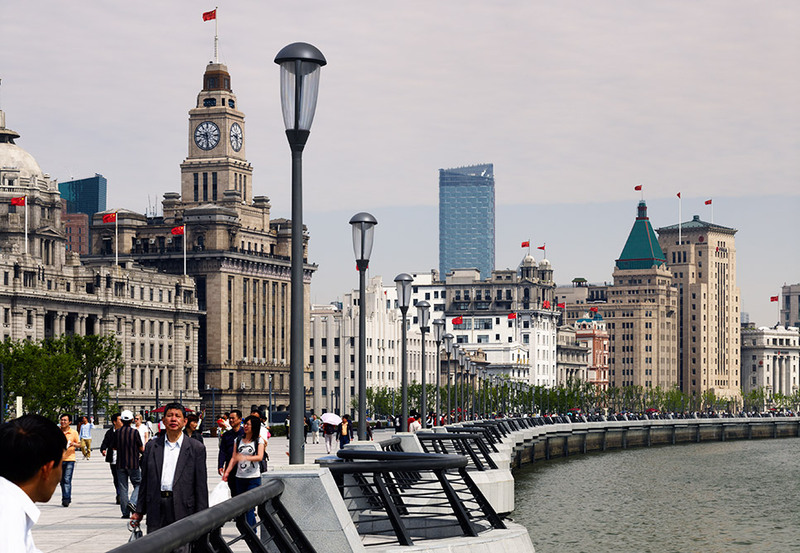 The Bund usually refers to the buildings and wharves on this section of the road, as well as some adjacent areas. It is one of the most famous tourist destinations in Shanghai. Building heights are restricted in this area. - Wikipedia. Nanjing Road (Chinese: 南京路; pinyin: Nánjīng Lù) is the main shopping street of Shanghai, China, and is one of the world's busiest shopping streets. It is named after the city of Nanjing, capital of Jiangsu province neighbouring Shanghai. Today's Nanjing Road comprises two sections, Nanjing Road East and Nanjing Road West. In some contexts, "Nanjing Road" refers only to what was pre-1945 Nanjing Road, today's Nanjing Road East, which is largely pedestrianised. Before the adoption of the pinyin romanisation in the 1950s, its name was rendered as Nanking Road in English. - Wikipedia. Tengok gambar pun dah teruja apatah lagi dah sampai sana nanti. Shopping, shopping & shopping! Based on previous experience travel with Hai-O, layanan memang tiptop from hotel, transportation, halal food, place to visit, all are awesome. Untung dapat melancong percuma bersama Hai-O. Okay all. Doakan perjalanan kami selamat pergi dan selamat pulang. U all boleh tinggalkan komen di sini & redeem your souvenir bila kami balik nanti ya!. Stay tuned at this page for more updates.